Brief Synopsis – A poet/swordsman with a large nose helps a fellow soldier, who is good looking but not eloquent woo the woman he himself is in love with. My Take on it – As many of you know, I’m not the biggest fan of foreign language films and have done all I can over the years to avoid watching them. In my attempt to expand my movie knowledge even more, I decided to watch more movies not in English. This is a film that I’ve known about ever since it came out and decided that it was now the time to finally check of Gerard Depardieu’s Oscar nominated performance of the story of a man with a big nose who tries to win the heart of the woman he loves yet also helps a good looking friend of his with less eloquent verbal aptitude also try to win her heart. I have been quiet familiar with the subject matter of this story ever since I saw the modern adaptation of this story with Steve Martin and Darryl Hannah called Roxanne (1987). Depardieu does a great job in the lead and was very deserving of his Oscar nomination, but he was unfortunately up against Jeremy Irons as Claus Von Bulow in Reversal of Fortune (1990) and despite giving the second best performance that year, Depardieu didn’t stand a chance. The pacing of the story works really well and they manage to show us the wisdom and humor of the main character so well here. The film runs a bit too long and does lag at a few points and might have been even better had it been cut slightly which might have made it a bit tighter. Overall tho, this is a very enjoyable version of this story and woks quite well the whole time. 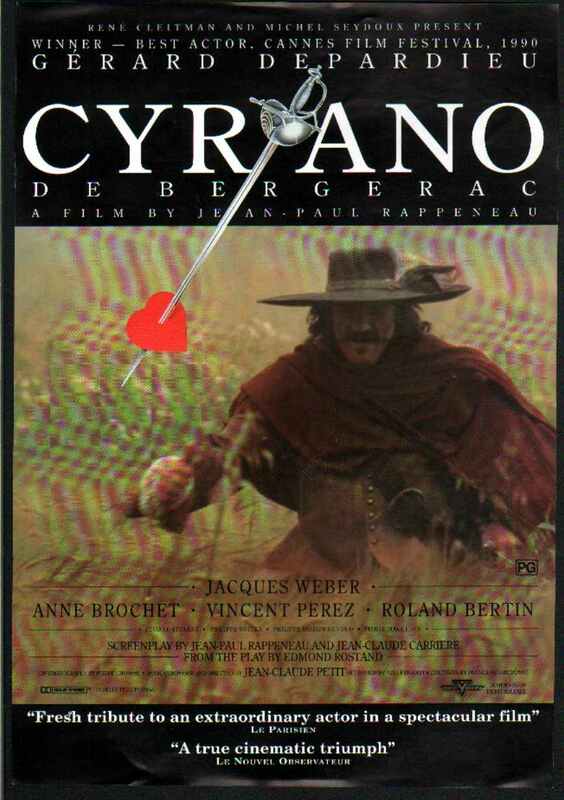 Bottom Line – Great version of the Cyrano story. Depardieu does a great job in the lead and was very deserving of an Oscar nomination for Best Actor for his performance but lost to Jeremy Irons’ portrayal of Claus Von Bulow in Reversal of Fortune (1990). The story moves along at a great pace and we get the known the wisdom and humor of the main character quite well. I’m still a bigger fan of the modern version of the story – Roxanne (1987) starring Steve Martin and Daryl Hannah. Despite the good pacing, this film does feel a bit too long, and cutting it down a bit more would have made it tighter. Recommended!